Pastor Matt Powell, the owner of Casper, Wyo.-based Skyline Gardens. Photo courtesy of Skyline Gardens. Matt Powell opens the door to his hydroponic lettuce farm, housed in a used refrigerated storage container on the corner of his Casper, Wyoming property, and the Marriage of Figaro fills the air. “My little Mp3 there is loaded up with Mozart and Bach. The study I heard said they tested growing plants in three sound proof environments. They had classical in one, death metal in another and silence in a third. 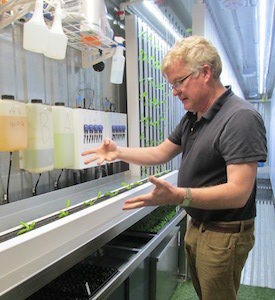 Classical did the best, death metal did the second best,” laughs Powell explaining how his fresh hyperlocal greens are grown with the aid of some classic tunes as they stay cool in their farm-in-a-box environment. 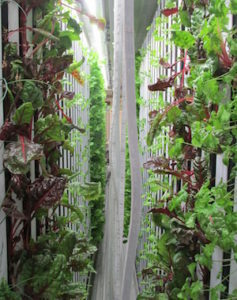 The enclosed vertical farm, Skyline Gardens, came with the hydroponics already in place from Boston-based Freight Farms. This made it a little easier for Pastor Matt Powell, former computer salesman and current professional theologian, to find his way to a sustainable side business in an area in need of sustainable businesses. Using filtered water, nutrients, red and blue grow lights and of course, classical music, Powell will produce, at capacity, approximately 500 heads of fresh greens for the people of Casper every week. Business is growing steadily and a few harvests have already occurred. Each variety of lettuce, Swiss chard and culinary herbs grows in isolation in one of the easy to remove and handle vertical growing towers. Powell labels the towers with dry erase marker to keep track of varieties, planting time and harvest requirements. As Powell explains, shipping container farms are ideally suited to the short growing season and temperamental weather of the Equality State. “It’s an enterprise that’s really custom suited to this area and just the lifestyle around here. People have land and it’s fairly easy to put one of these boxes down,” says Powell. Freight Farms uses discarded and retired refrigerated storage containers to build their hydro farms. Powell’s was the first one they sent to Wyoming so they had to add a wind barrier to the outside of the fan so it wouldn’t be pulled off or damaged by the high winds. The container ships out of Boston but the ZipGrow vertical hydroponic towers inside come from the folks at Bright Agrotech in Laramie, another indoor agriculture-focused Wyoming company. Skyline Gardens will produce approximately 500 heads of lettuce per week at capacity. Photo courtesy of Skyline Gardens. Skyline is almost at profit level on the month to month books, but Powell predicts three years at this rate of growth to pay startup costs back in full. Self-funded, Powell realizes the wariness of banks, especially in a place like Wyoming where sustainable agriculture is still finding its feet, to fund container farms and similar new social enterprise style businesses. Powell has several direct sales customers who buy CSA style as well as his wholesale contracts. He also sells through a local aggregation group, Fresh Foods Wyoming, which takes his produce to the farmers market for him. Deliveries have proven the most time consuming aspect of the business so far and for now Powell wants to concentrate on solidifying his customer base with no plans to expand. “Right now I think this is enough for me. I have my main job and I’m not planning on leaving that any time soon. Even now, in the startup phase, the time commitment is substantial,” says Powell.